A laboratory prototype of MARVEL, one of the world's smallest 3-D cameras. MARVEL is in the center foreground. On the display is a 3-D image of the interior of a walnut, taken by MARVEL previously, which has characteristics similar to that of a brain. 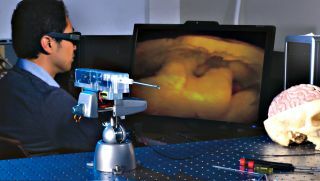 Scientists are one step closer to changing the way doctors do brain surgery, thanks to a tiny 3D camera in development at NASA's Jet Propulsion Laboratory (JPL) in Pasadena, California. Operating on the brain requires doctors to see details on incredibly small scales. The new JPL camera could take 3D images from inside the brain, allowing surgeons to see brain tissue in intricate detail and leading to faster, safer surgeries, NASA officials said. The new device, known as MARVEL (short for Multi-Angle Rear Viewing Endoscopic Tool) is attached to an endoscope, a snaking instrument used to examine the inside of the human body. "With one of the world's smallest 3D cameras, MARVEL is designed for minimally invasive brain surgery," Harish Manohara, principal investigator of the project at JPL, said in a statement. Manohara is working with surgeon Dr. Hrayr Shahinian, who is based at the Skull Base Institute in Los Angeles. MARVEL's camera is only 0.2 inches (4 millimeters) in diameter and just 0.6 inches (15 mm) long. The whole system, including the endoscope, can bend around corners with up to a 120-degree arc. This maneuverability will allow surgeons to see large sections of the brain with MARVEL, NASA officials said. The MARVEL camera employs two small holes, each of which has its own color filter. Photos captured using each filter are combined to create 3D images. MARVEL could make brain surgery quicker and cheaper, with less recovery time required, NASA officials said. That's because the endoscope procedure should obviate the need for an "open craniotomy," in which large pieces of the skull are removed. JPL scientists think the camera could someday also have applications for space exploration. The tiny, highly capable camera could ride along on robotic missions to other planets, giving researchers access to intricate 3D images of alien worlds' terrain. "You can implement a zoom function and get close-up images showing the surface roughness of rock and other microscopic details," Manohara said in the same statement. For now, researchers are working to take MARVEL — the prototype of which won the Outstanding Technology Development award from the Federal Laboratory Consortium in August 2015 — one step closer to the operating room. The next step involves developing a clinical prototype that meets the requirements of the U.S. Food and Drug Administration, NASA officials said.